Bring me the head of Ernest P. Worrell! Ah, rubber-faced Ernest P. Worrell. With your denim vest and baseball cap, you regaled a generation of children and their parents from the late ’80s and well into the ’90s. 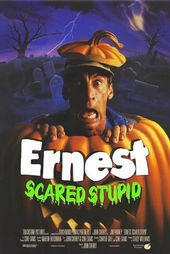 The fourth film to star Jim Varney’s Ernest character, Ernest Scared Stupid (also known as “Ernest Saves Halloween”) sees our hapless hero battle an army of monstrous trolls in order to save a small town on Halloween. Though generally regarded as low-brow entertainment, the Ernest movies featured a peculiar mix of physical comedy, puns, as well as numerous references to classic films. This meant that they could be easily enjoyed by children, but also that accompanying adults could chuckle now and then at an oddly-placed Spartacus reference or an appearance by someone like Eartha Kitt (as Francis "Old Lady" Hackmore). 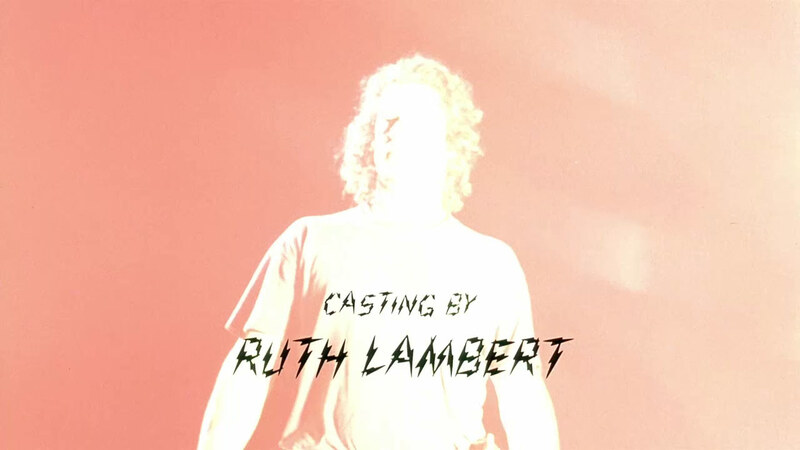 Scared Stupid’s opening sequence perfectly zeroes in on that intersection of base physicality and esoteric film knowledge. 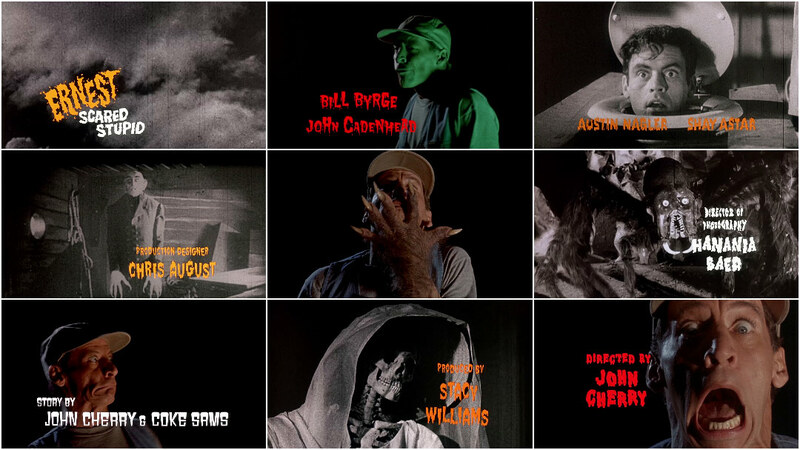 Varney’s facial contortions are intercut with a slew of clips from vintage horror and science fiction films and shots featuring the limbs of various creatures (created by the Chiodo Brothers), resulting in a montage that was modern in its use of typography and live-action while harking back to its campy influences. The clips include such classics as Nosferatu (1922), White Zombie (1932), Phantom from Space (1953), The Brain from Planet Arous (1957), The Screaming Skull (1958), Missile to the Moon (1958), The Hideous Sun Demon (1959), The Giant Gila Monster (1959), The Killer Shrews (1959), Battle Beyond the Sun, and the Roger Corman-directed black comedy The Little Shop of Horrors (1960). * One need only read the comments on this Youtube clip or in this Reddit thread to realize the lasting effect of Trantor and the trolls. 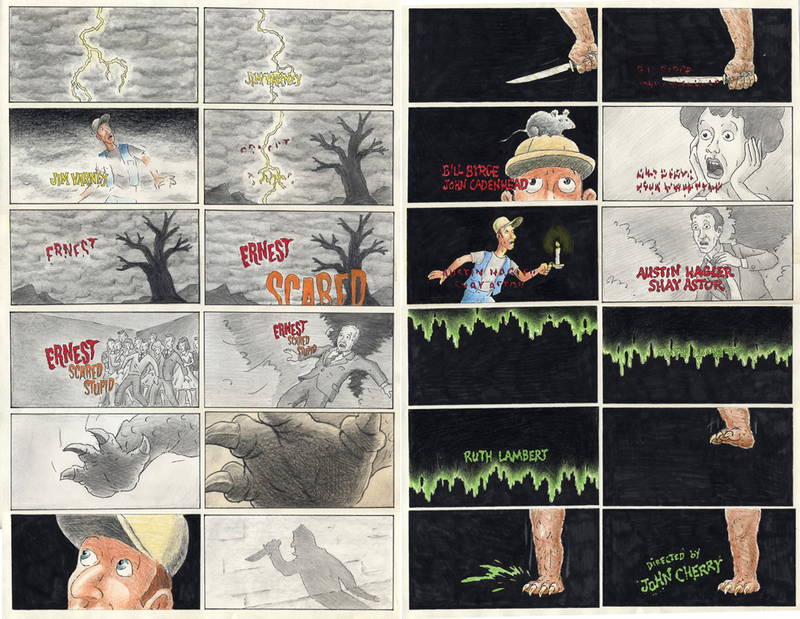 A discussion with Main Title Designer BARBARA LASZEWSKI GARNER. How did you become involved with the Ernest franchise? I worked for the Carden and Cherry advertising agency as an assistant art director, the agency that created all the Vern commercials. That became a TV show and, later, the film series. John Cherry asked me to work on the Hey Vern, It's Ernest! TV show titles and we won a Daytime Emmy Award in 1989. Consequently, I worked on most of their movie titles. How did the concept for Ernest Scared Stupid come about? The movie was the brainchild of John Cherry and Coke Sams. The titles were a collaboration between John and myself. John and I did the storyboarding... I researched and picked the public domain vintage horror footage, directed the shoot, edited it with my super editor Craig Culver, designed the typography, directed the sequence timing, and supervised post production – optical printing and animation of the typography – in LA at Cinema Research. Can you tell us about the typography? Were the typefaces hand-drawn or pre-existing? Hmmm... as I remember they were existing fonts that I laid up on cels in position and then they were animated or effects were used in shooting on the animation stand. A shower glass was panned over some to get the ripple effect. It was all done with either hand-drawn animation as in the drips and splatters or with animation camera effects as in the ripple with the shower glass. How was the music developed, and at what point did it come in? The music was scored from our storyboard and the clips were then edited to the music. The oohs and ahhs were part of the title music. Bruce Arntson and Kirby Shelstad did all the music for the titles and scored all the films as well. Who's the fellow at around 1:09, under the “Casting By” credit? Ha! Well, probably some crew member that ended up on the end of a B-roll where it is normally over-exposed. We needed a flash for a transition from Ernest to a scene in one of the horror clips – it's meant to look like he was electrified and turned into the character in the vintage clip. What was it like working with Jim Varney? Fabulous! He didn't need a lot of direction. I just told him the premise for each scene and he just did it in one or two takes. I loved the old grade B movie clips. It was hard to find public domain ones that were suitable... Disney's legal department was all over that. Because of the restrictions the clips are really cheesy which makes it all the better. I loved working with John Cherry, Jim Varney, Craig and Bruce and Kirby. All in all, this was a fun and successful production! Creature Arms: The Chiodo Bros.